The Minden Master Propane Gas Grill was created to offer an alternative to typical barbeque grilling products. With its many features, this grill outshines comparable propane gas grills. The Minden Master Gas Grill is designed for experienced chefs as well as the novice user. The grill is not bulky, but it packs a powerful punch with 30,000 BTUs of heat and 3 burners. The full-size Minden Master Gas Grill is designed to fit your outdoor living lifestyle without overwhelming your outdoor space. This grill has taken a “less is more” approach, yielding a superior product. The condiment tray doubles as your extended work surface. The lid lifts to expose a handy tray with recessed areas to store your relishes, barbeque sauce, and even utensils. The cutting board has a unique self healing design. It is made of polypropylene. One side is flush with the grilling surface for general cutting. The other side has a lip around the entire cutting board for cutting meats. The push button electronic ignition starter doesn’t need batteries. It provides a continuous spark for easy lighting. You will never over cook your best steak with this built in temperature gauge. Cook with precise perfection. The grill comes with one tool, the only tool needed to assemble the unit. Minden Grill Company is focused on providing you with the best working, longest lasting propane gas grill. Receive a limited 1-year, end-to-end warranty on all parts. Rather than provide 90 days of warranty on some parts, 1 year on others, and 5 years on the unbreakable portions of the grill, we provide a one-year warranty on ALL parts. This warranty does not apply to parts that have been damaged by the user, nor does it apply to grills that have been damaged due to mishandling. Warranty claims will only be honored for registered owners of the grill. This power packed grill comes with many accessories as well as four different colors to match any outdoor decor. The colors that are available are Black, Green, Red and Blue. Misting Fans help beat the heat and improve your outdoor experience. A chemical substance containing hydrogen with the ability to dissolve metals, neutralize alkaline materials and combine with bases to form salts. Acid is used to lower (decrease) pH and total alkalinity of swimming pool and spa water. Examples are muriatic acid (hydrochloric) and dry acid (sodium bisulfate). The amount of acid required to bring high pH and total alkalinity down to their proper levels. Determined by an acid demand test. Microscopic aquatic plant life that contain chlorophyll. Algae are nourished by carbon dioxide (C02) and use sunlight to carry out photosynthesis. It is introduced by rain or wind and grows in colonies producing nuisance masses. Algae are not disease-causing, but can harbor bacteria, create a high chlorine demand, and it is slippery. There are 21,000 known species of algae. The most common pool types are black, blue-green, green and mustard (yellow or brown). Pink or red-colored algae-like organisms exist but are bacteria and not algae. Maintaining proper sanitizer levels, brushing and super-chlorination will help prevent its occurrence. Also called algaecide. A natural or synthetic chemical designed to kill, destroy or control algae. Also called total alkalinity. A measure of the pH-buffering capacity of water or water’s resistance to change in pH. Composed of the hydroxides, carbonates and bicarbonates in the water. One of the basic water tests necessary to determine water balance. Introduced into the water by swimmers as waste (perspiration or urine) or by other means. Quickly forms foul-smelling, body irritating chloramines- an undesirable, less effective form of chlorine. See CHLORAMINES or COMBINED CHLORINE. The amount of chlorine in the pool water that is available to sanitize or disinfect the water. Sometimes called residual chlorine. By-products formed when bromine reacts with swimmer waste (perspiration or urine), nitrogen or fertilizer. Bromamines are active disinfectants and do not have an odor. A mechanical or electrical device for dispensing bromine at a controlled rate. Most often a tank, canister or floater filled with tablets of bromine. A halogen element in the same group as chlorine and fluorine. Also a common name for several chemical compounds containing bromine that are used as disinfectants to destroy bacteria and algae in swimming pools and spas. Most commonly available as organic bromine in a tablet or granular, or as sodium bromide, a granular salt. The calcium content of the water. Calcium hardness is sometimes confused with the terms water hardness and total hardness. Too little calcium hardness and the water is corrosive. Too much calcium hardness and the water is scale forming. One of the basic water tests necessary to determine water balance. Minimum level is 150 ppm. Ideal range is 200-400 ppm. Copper algaecides that contain a special ingredient to prevent the copper from staining the pool walls and bottom or producing colored water. Undesirable, foul-smelling, body-irritating compounds formed when insufficient levels of free available chlorine react with ammonia and other nitrogen containing compounds (swimmer and bather waste, fertilizer, perspiration, urine, etc.). Chloramines are still disinfectants, but they are a much weaker, ineffective form of chlorine. Chloramines are removed by super-chlorination or shock treating. A mechanical or electrical device for dispensing chlorine at a controlled rate. Most often a tank, canister or floater filled with tablets of chlorine. The amount of chlorine necessary to oxidize all organic matter (bacteria, algae, chloramines, ammonia, and nitrogen compounds) in the pool or spa water. Also called coagulant or flocculant. A chemical compound used to gather (coagulate or agglomerate), or to precipitate suspended particles so they may be removed by vacuuming or filtration. There are two types; inorganic salts of aluminum (alum) or water-soluble organic polyelectrolytes. Also called stabilizer or cyanuric acid. It is a chemical that slows down the degradation of chlorine in the water by sunlight. The minimum effective level is 20 ppm as measured by a test kit. Very high levels of Cyanuric acid (above 300 ppm) can slow down chlorine activity or effectiveness. Conditioner does not protect bromine from sunlight. A chemical compound that contains the element copper. Copper sulfate was one of the original copper algaecides. Too much copper in the water can cause green-colored stains or water. Newer copper algaecides contain an ingredient that prevents the copper from staining but does not affect copper’s ability to kill algae. These special copper algaecides are called chelated copper algaecides. Also called conditioner or stabilizer, this chemical compound protects chlorine in the water from being destroyed by sunlight. The minimum level is 20 ppm. Very high levels of Cyanuric acid (above 300 ppm) can slow down chlorine activity or effectiveness. Cyanuric acid does not protect bromine from sunlight. Diatomaceous Earth Filter. A filter designed to use diatomaceous earth (D.E.) as the filter medium. The D.E. is added through the skimmer with the pump on, which takes the D.E. and deposits it on a grid. The D.E. then becomes the filter medium. Also called D.E. powder. A white powder composed of fossilized skeletons of one celled organisms called diatoms. The skeletons are porous and have microscopic spaces. The powder is added through the skimmer with the pump on, which takes the D.E. and deposits it on a grid. The D.E. then becomes the filter medium. The common name for sodium dichloroisocyanurate. A fast dissolving chlorine compound containing chlorine and cyanuric acid (stabilizer or conditioner). It has a neutral pH and is quick dissolving, so it can be used for regular chlorination or super-chlorination. Chemically, sodium bisulfate. A dry white crystal that produces acid when added to water. It is used for lowering pH and total alkalinity. Safer to handle than muriatic acid. The water that flows out of a pump, filter or heater, usually on its way back to the pool or spa. A chemical compound added to the water or to the filter that allows the existing filter to become more efficient. Examples are alum, water clarifiers and D.E. powder. The combination, agglomeration, aggregation or coagulation of suspended particles in such a way that they form small clumps (called a FLOC). The amount of active chlorine in the pool or spa water that is available to sanitize or disinfect the water. Sometimes called residual or available chlorine. The amount of calcium and magnesium dissolved in the water. “Water” or “total” hardness refers to the total magnesium and calcium dissolved in the water. Calcium hardness refers to just the calcium. Measured by a test kit and expressed as ppm. The proper range is 200-400 ppm. A substance that is neither animal nor plant. It is a chemical compound, usually inorganic in nature (no carbon atoms), which occurs naturally. Examples are quartz, feldspar or compounds of crystalline structure. It sometimes includes soluble “rocks” such as limestone. Ground water can dissolve all or a portion of these rocks and the minerals contained in these rocks, thus causing these minerals to be present in tap water. Certain geographic locations contain a high level of minerals which can cause staining and scale problems in pool and spa water. A term given to a class of chemical compounds that are used to oxidize or shock the water (destroy ammonia, nitrogen and swimmer waste). They contain no chlorine or bromine and do not kill living organisms. swimmers may re-enter the pool in only 15 minutes after adding a non-chlorine shock. Refers to volatile, biodegradable and sometimes combustible chemical compounds containing carbon atoms bonded together with other elements. The principal groups of organic substances found in water are proteins, carbohydrates, fats and oils. See ORGANIC WASTE. Also called swimmer or bather waste. All of the soap, deodorant, suntan lotion, lipstick, makeup, cologne, body oils, sweat, spit, urine, etc., brought into the water. They also form chloramines, which are foul-smelling and body irritants. Requires large amounts of chlorine or non-chlorine shock to destroy. To rid the water of ammonia, nitrogen compounds and swimmer waste (organic compounds). These organic compounds disable chlorine, are body irritants and have a foul smell. Removal is accomplished by super-chlorination or by shock treating with a non-chlorine oxidizer. A shocking or sanitizing compound that removes or destroys built-up contaminants and chloramines in pool water. Most chlorinating, brominating, and oxygenating compounds are considered oxidizers. Usually the fast dissolving oxidizers which contain chlorine, such as hypochlorites, are typically used to “superchlorinate” the water. An abbreviation for parts per million. It is a weight-to-weight expression. It means 1 part in 1 million parts, such as 1lb of chlorine in 1 million lbs. of water. Many of the common pool water tests, as well as acceptable ranges, are stated a ppm. For example, free available chlorine should be kept between 1.0 and 3.0 ppm; total alkalinity should be between 80 and 120 ppm; and water hardness should be between 200 and 400 ppm. The amount of measurable bromine/chlorine remaining after treating the water. The amount of bromine/chlorine left in the pool or spa water after the bromine/chlorine demand has been satisfied. The precipitate that forms on surfaces in contact with water when the calcium hardness, pH or total alkalinity levels are too high. Results from chemically unbalanced pool and spa water. Scale may appear as gray, white or dark streaks on the plaster, fiberglass or vinyl. It may also appear as a hard crust around the tile. The practice of adding significant amounts of fast-dissolving oxidizing chemical to the water to destroy ammonia and nitrogen compounds or swimmer waste. A family of chlorine pool sanitizers that contain conditioner (cyanuric acid) to protect the chlorine from the degrading UV rays in sunlight. Most common types are sodium dichlor and trichlor. The granular form is dichlor, which is fast-dissolving and can be used for regular chlorination or super-chlorination by broadcasting into the pool or spa. Tablet or stick form is trichlor (which is usually used in a chlorine feeder- either the floating type or an in-line erosion type) used for regular chlorination only. A discoloration or a colored deposit on the walls or bottom of a swimming pool or spa. Most often, stains are metals such as iron, copper or manganese. They may appear as green, gray, brown or black. They may even discolor the water. Sometimes a sequestering agent or chelating agent will remove them. If not, usually an acid wash is necessary to remove them from the walls and bottom. The metals get in the water because the pH was too low or someone has added a low pH chemical directly into the circulation system. The low pH chemical dissolves a small amount of metal from the equipment. The metals come out of solution and deposit or stain the surfaces of the walls and bottom of the pool. Stains are sometimes confused with scale. The practice of adding an extra large dose of chlorine to the water to destroy ammonia, nitrogen and swimmer waste, which can build up in the water. This level of chlorine is required to destroy all of the combined chlorine in the water which is called breakpoint chlorination. The total amount of chlorine in the water. It includes both free, available and combined chlorine. Total Dissolved Solids is a measure of the total amount of dissolved material in the water. It is comprised of the spent or carrier chemicals in the water every time chemicals are added, as well as the hardness, alkalinity, chlorides, sodium, magnesium, calcium, etc. The maximum amount in pools is 2500 ppm. Maximum in spas is 1500 over starting TDS. The only way to effectively lower TDS is to drain part or all of the water and replace it with low TDS water. A slow-dissolving tablet or granular, stabilized organic chlorine compound providing 90% available chlorine. Used for regular chlorination but must be dispensed using a floating feeder or an in-line feeder (chlorinator). 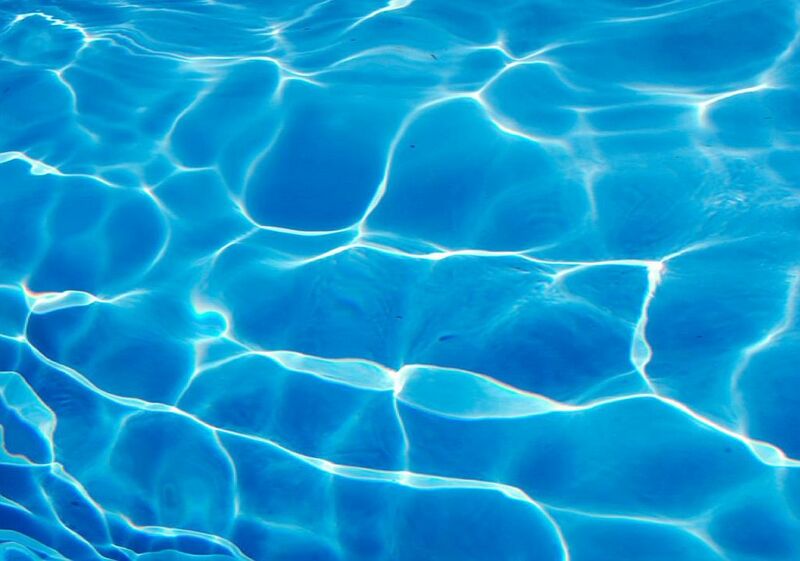 Trichlor contains an ingredient that prevents the chlorine form being destroyed by UV rays of the sun. Trichlor has a pH of 2.8, and regular trichlor tabs should not be placed in the skimmer as the low pH will corrode the metal components in the equipment. The cloudy condition of the water due to the presence of extremely fine particles in suspension that cannot be trapped by the filter because they are too small. Adding a clarifier will coagulate the particles and make the filter more efficient. Also called coagulant or flocculant. A chemical compound used to gather or to precipitate suspended particles so they may be removed by vacuuming or filtration.